US Marine Corps Sgt. 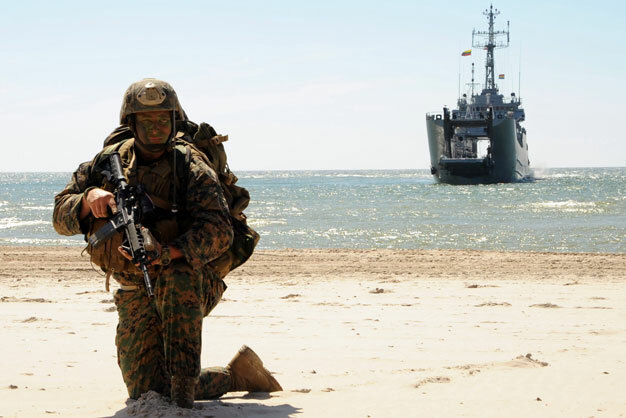 Christopher Judy holds position on a beach with the Polish vessel ORP Krakow in the background during a Baltic Operations (BALTOPS) 2012 amphibious operation exercise in Palanga, Lithuania. BALTOPS is a joint and combined exercise designed to enhance multinational maritime capabilities and interoperability between the U.S. and European nations in the Baltic region. Department of Defense photo by Mass Communication Specialist 2nd Class Jeff Troutman.